In the latest battle of the baby swings, the Graco DuetSoothe Swing & Rocker has unseated the ubiquitous Fisher-Price Cradle 'n Swing to take our top spot among full-size swings. Both swings are soothing champs, with multiple swinging motions, lullabies and nature sounds. But the Graco adds a bit more versatility by converting to a vibrating seat that can be moved around the house as needed. The Graco DuetSoothe Swing & Rocker has everything parents expect in a full-size swing: It swings multiple directions, has several recline settings, plugs into the wall, and includes soothing songs and sounds. It's also more versatile than many swings; parents can pop the seat out of the frame to use as a vibrating seat or rocker anywhere in the house. Parents who want the perks of a full-size swing with a smaller footprint like the 4moms mamaRoo, which has five unique motions. Movement and speed can be controlled from a Bluetooth-enabled smartphone. A music hookup allows parents to soothe babies with their own preferred lullabies, or they can opt for built-in nature sounds. Other features include an infinite recline and plush machine-washable padding. 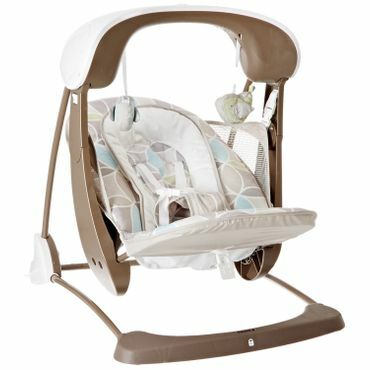 Reviewers say the Fisher-Price Deluxe Take Along Swing and Seat folds compactly and easily to go wherever it's needed. Six swing speeds, vibration, 10 songs and nature sounds offer plenty of soothing options on the go. A five-point harness keeps babies safe, and the machine-washable pad can be thrown in the dryer. A carry handle makes moving it around the house a cinch. Babies who may not like swinging but enjoy rocking and vibration have a versatile, portable option in the Fisher-Price Newborn-to-Toddler Portable Rocker. Parents say this lightweight rocker easily folds flat for travel or storage. A 40-pound weight limit means even bigger toddlers can still sit in it as they read or watch a quick cartoon. A full-size baby swing can safely soothe your child when nothing else seems to work. Most have at least three seat positions to accommodate everything from a snoozing newborn baby to one who's a bit older and more alert. These larger swings offer a more powerful swinging motion, and some can move both front to back and side to side, giving you a greater shot at calming a fussy baby. Many also feature interactive toys and music to engage baby in play during wakeful moments, or convert into a bouncer or rocker that can be popped out of the frame and carried around the house. Most useful during baby's first few months, today's full-size swings can usually be plugged in to the wall. Portable swings, or travel swings, typically aren't as flashy or feature-rich as full-size models. But they're a popular choice for parents looking for a swing that can go with them to grandma's house or one that's less of a space hog and easier to move from room to room. Note that most portable swings require batteries, and they may be outgrown more quickly than full-size swings. Whatever type of swing you choose, always use them safely by following all manufacturer guidelines. For example, always use the harness and never put a swing on an elevated surface. Experts also advise against letting small infants snooze in swings for long periods of time, as they pose a greater suffocation risk than a flat, firm sleep surface like a crib mattress. Before buying, also check for recalls, common among baby products. In April of 2016, Fisher-Price recalled 34,000 of its Soothing Savanna and Sweet Surroundings Cradle 'n Swings because a seat peg could come loose and cause the swing seat to fall to the ground. Many infants like swings, but some don't. The only way to find out is to put your child in one and see whether they take to it. And sometimes, simplicity is best: The multiple music options, shiny toys and range of speeds on today's swings can sometimes prove overstimulating instead of calming. What works best for your baby may require some trial and error to discover. If you still need other baby gear to outfit your nursery, check out our separate reports on baby monitors, baby gates, high chairs, portable cribs, baby carriers, car seats and strollers. "Around the House: Monitors, Diaper Pails, Safety & More"
"The Search for the Best Baby Swing"
As always, we first looked for any in-depth, hands-on testing of baby swings, which we found at BabyGearLab.com and TheNightlight.com. Reviews and ratings that include parent feedback, including resources from "Baby Bargains," LuciesList.com and BabyCenter.com, are also useful. Parents' reviews from Amazon.com, Target.com and BabiesRUs.com provide real-world perspectives on baby swings. We considered reviewers' opinions on features, ease of use and durability while evaluating our sources to help you find the best baby swings. Graco and Fisher-Price have been doing battle in the baby-swing market for quite some time, but Graco comes out on top this go-around with the Graco DuetSoothe Swing & Rocker (Est. $150). As its name suggests, the DuetSoothe is actually two products in one, with a seat that pops out of the swing frame to become a portable rocker. The swing runs on either batteries or plug-in power and comes in at least seven color schemes. Like many of today's full-size swings, the DuetSoothe has six speeds and a seat that can be positioned three different directions. There are three recline settings and the swing can move from front to back or side to side. Ten songs, five nature sounds and a mobile with hanging toys are also included. What sets the DuetSoothe apart is its two-in-one design, as well as two-speed vibration that is still available when it's in rocker-only mode. Parents love having all these choices, saying it's easy to find a combination that calms most babies, though some say the rocker is a bit heavy for toting around the house. Also, experts with BabyGearLab.com wish the seat were a bit deeper to better comfort babies, but they say the fabric is high-quality and comfy. The swing does not fold for storage, but most reviewers say it's easy to put together. The DuetSoothe has machine-washable padding, with an insert that's especially easy to remove, parents say. Though there are a few reports of failed motors, owners' main complaint is that some swings make a clicking noise while operating. For some whose babies startle easily, this seems to be a deal-breaker; for others, it's a minor annoyance only for the grownups. As a swing, the DuetSoothe can accommodate up to 30 pounds, while the rocker has a maximum of 25 pounds. It comes with a one-year warranty. 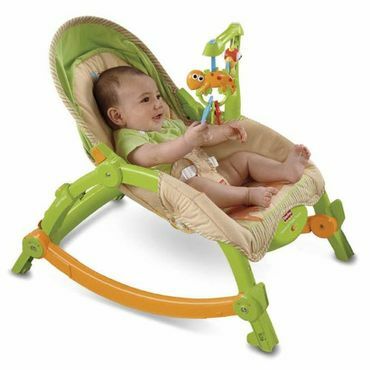 One of the most loved baby swings on the market, the Fisher-Price Cradle 'n Swing (Est. $105) receives accolades for its plush fabric and versatile features. Reviewers also love being able to use batteries or electric power. The Cradle 'n Swing comes in a dizzying number of slightly different versions, but we recommend the My Little Snugabunny, My Little Snugapuppy and My Little Snugabear, which differ only by color scheme and toys. Note that the Soothing Savanna and Sweet Surroundings Cradle 'n Swing models were recalled in April 2016 over a potential fall risk. Reviewers say the Cradle 'n Swing has features to satisfy both baby and parent, including six speed settings, a choice of side-to-side or front-to-back swinging, two recline positions, and the ability to easily change the seat to face the front or side with the press of a button. Plus, parents say their babies love the 16 songs, two nature sound options, hanging toys and mirror. 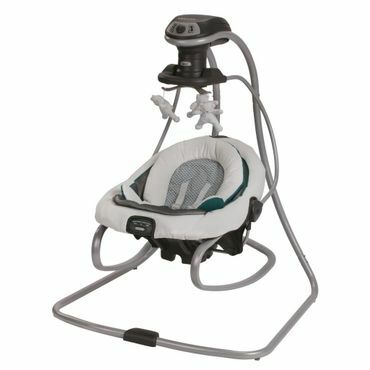 It does not feature a removable rocker or vibration like the Graco DuetSoothe Swing & Rocker, however. Testers with BabyGearLab.com give it top marks for soothing, saying the cozy seat is deep enough to cocoon and comfort babies. Owners say the swing is easy to assemble. Though it can be folded for easier storage, some reviewers note that it's still not that compact when folded. The Cradle 'n Swing has machine-washable padding, but a few reviewers say it can be hard to remove. Several owners also report faulty motors. While the swing comes with a one-year warranty that covers a replacement during that time period, some parents have reported long waits. The swing has a plush head-to-toe body support pillow and five-point harness. Maximum weight capacity is 25 pounds, 5 less than the DuetSoothe. Parents who can't or don't want to devote the whole corner of a room to a baby swing may want to check out the 4moms mamaRoo (Est. $200), a sleek combination swing/bouncer with a unique design that saves space in homes where space is a premium. The mamaRoo plugs into the wall, and five different colors are available. One of reviewers' favorite things about the mamaRoo is its small footprint, though potential buyers should note it's still too bulky for easy travel. Another unique feature is that it's Bluetooth-compatible, so parents can control the mamaRoo from their smartphones. There are five different motions and five speeds, but some reviewers complain that the highest speed is still too slow to calm infants. Testers with BabyGearLab.com also note that the shallow seat may not be comforting enough for some babies, and say the movement is too controlled. Some parents like the four built-in nature sounds, but most are more impressed with the MP3 hook-up that allows endless possibilities for music, lullabies and white noise. Speaker quality receives mixed reviews. 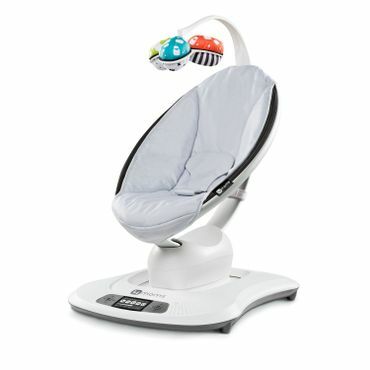 The mamaRoo comes with three suspended, reversible toy balls, but they don't dangle or spin. Owners say it's easy to remove and machine-wash the padding on mamaRoo. A malfunctioning base has been reported by a few users, but 4moms was willing to fix problems within the one-year warranty period. Most reviewers say the seat feels stable and has an infinite recline, which they like, but a few question the safety of the most upright position since there is only a three-point harness. A handful of buyers also report concerns that a curious toddler could pinch a finger in the seat base. The seat can accommodate up to 25 pounds. Good battery life or electrical power.